Don’t overload your electrical outlets! Did you know that more than 3,300 fires each year are caused by extension cords? Use extension cords only when necessary & only temporary, make sure cords do not dangle from an area where they can be tripped on. When in use, make sure the plugs are fully plugged in with no part of the plug showing. Definitely do not overload the outlets like the image shown here!!! 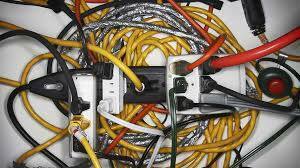 Don't overload your electrical outlets!